Providing a strong package of benefits is a competitive imperative in today’s business world. Like many employers, you’ve probably worked hard to put together a solid menu of offerings to your staff. Unfortunately, many employees don’t perceive the full value of the benefits they receive. Why is this important? An underwhelming perception of value could cause good employees to move on to “greener” pastures. It could also inhibit better job candidates from seeking employment at your company. Perhaps worst of all, if employees don’t fully value their benefits, they might not fully use them — which means you’re wasting dollars and effort on procuring and maintaining a strong package. Among the most successful communication strategies for promoting benefits’ value is often the least commonly used. That is, target the life stage of your employees. For example, an employee who’s just entering the workforce in his or her twenties will have a much different view of a 401(k) plan than someone nearing retirement. A younger employee will also likely view health care benefits differently. Employers who tailor their communications to the recipient’s generation can improve their success rate at getting workers to understand their benefits. There are many other strategies to consider as well. For starters, create a year-round benefits communication program that features clear, concise language and graphics. 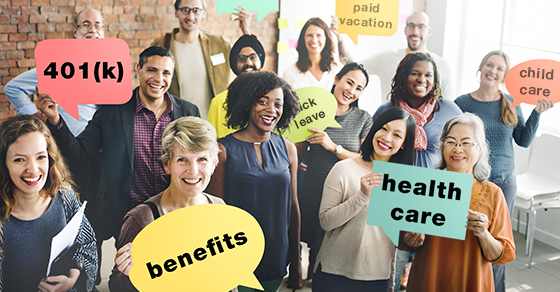 Many employers discuss benefits with their workforces only during open enrollment periods. Also, gather feedback to determine employees’ informational needs. You may learn that you have to start communicating in multiple languages, for instance. You might also be able to identify staff members who are particularly knowledgeable about benefits. These employees could serve as word-of-mouth champions of your package who can effectively explain things to others. Given the cost and effort you put into choosing, developing and offering benefits to your employees, the payoff could be much better. We can help you ensure you’re getting the most bang for your benefits buck.